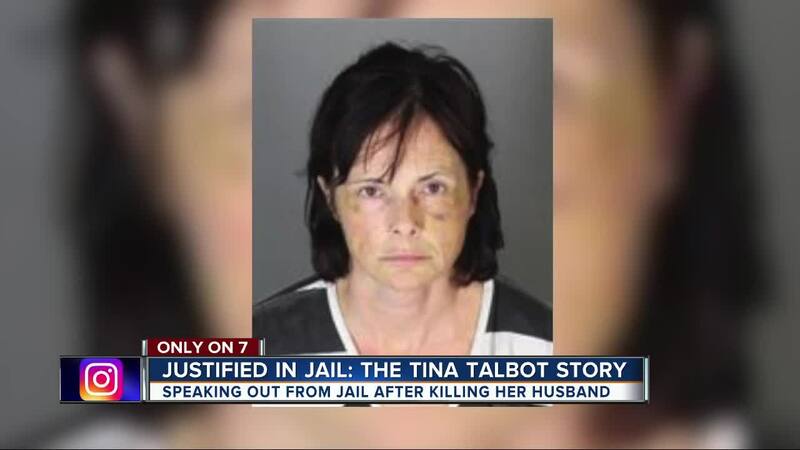 WATERFORD, Mich. (WXYZ) — Tina Talbot is locked up behind bars, convicted of killing her husband in Waterford last year. The 51-year-old plead guilty to manslaughter and was sentenced to 20 months to 15 years behind bars. She says she endured years of physical and mental abuse at the hands of her husband, who she says, even threatened to kill the couple's 7-year-old son. Now, Talbot is talking exclusively to 7 Action News reporter Alan Campbell from behind bars about the abuse leading up to that deadly day, and if she feels she deserves to be behind bars for what she did. "He said I’m going to kill your son and I’m going to do it in front of you," Talbot said of her husband Milosz Szcepanowicz. "And I’m going to watch how you suffer when I slit his throat from one ear to the other and I put his blood all over you." Talbot said the days leading up to Sept. 14, 2018 , were the darkest and most violent she has lived. She was beaten and raped daily, she said, and the threats towards her and her 7-year-old son with autism became more real. "All week long he kept saying, 'this week is going to culminate with somebody dying... and it’s not going to be me,'" Talbot recalled her husband saying. "Basically, it was just a week long of torture. He’s telling me that he was going to pull my fingernails out and he was going to pour salt where the fingernails had been. Everything we did, we did together for the rest of the week. I wasn’t allowed to go out of the house without my husband, we always had to do everything together." On the morning of Sept. 14, 2018, which was a Friday, Talbot, her 7-year-old son Phillip and her husband ran errands. Talbot says Szcepanowicz's demeanor was more aggressive this day, almost agitated. She says his anger grew throughout the morning. It was eventually when the family was in a Walmart parking lot that Talbot says Szcepanowicz's rage took a turn. "He pointed the gun at Phillip and I and said, 'you're going to die in the parking lot of Walmart,'" Talbot said. "I said, 'don’t do it, I don’t want to die here.'" "He said I’m going to kill your son and I’m going to do it in front of you." Talbot says Szcepanowicz then put the gun away and drove back to the couple's home in Waterford, but not without being beaten on the way home. She says once inside their home, Szcepanowicz put the gun on the table and went out back to sit on the porch. Phillip, Talbot's son, went into the living room and watched television. Talbot then went to the bathroom to look at her injuries, but not before grabbing the gun. "I got the gun and I took it back to the bathroom with me and hid it under a plant in there," she said. Talbot said at that point, she had to make a decision. One she would live with for the rest of her life. "I followed him out there and at that point, I had grabbed the gun and he sat in the chair," she said. "He’s like, 'one or two things is going to happen. You're either going to take that gun and you're going to shoot me, otherwise I’m going to take the gun from you and I’m going to shoot your son in front of you and I’m going to shoot you.'" Talbot continued, "He started to count and he was looking at me, and he just counted 'one, two...' and at three he started to leave the chair and he looked away for a split second, and at that point... I fired twice," Talbot said. "He fell to the chair and slumped over and I had to go back in and check on Phillip because he was in the house watching a show, he didn’t realize anything happened, thankfully. I got on the phone and dialed 911." 911: 911 what’s your emergency? Talbot: You need to send the police. I killed my husband. 911: Okay, how did you kill him? 911: OK, is there anyone else in the residence? Talbot: He threatened my son. 911: Okay, how old is your son? Waterford police arrived on the scene a short time later. Talbot was put in handcuffs. The bruises on her face were clearly visible. Pictures later taken at the jail the day of her arrest, showed the amount of bruising all over her body. Talbot says the pain was visible, but she would heal. Looking back, Talbot says that when she pulled the trigger that day in September, that it was her only option. "I think I did what I had to do to protect my child and myself," she said. "In that moment, I had no other choice.". Talbot's family and friends have been through a lot during this entire ordeal. From her parents disapproval of her relationship, to Szcepanowicz and her constantly living in fear, to the alienation of her friends all for her husband. However, the most difficult aspect for Talbot wasn't trying to hide her bruises or make up lies to cover for her husband's abuse, it wasn't even pulling the trigger. The most difficult part of this ordeal, Talbot says, was having to tell her son she wasn't going to be around for some time. "I had to try and explain to him that mommy is going away again. Going to work," she said. Talbot told her son she wasn’t sure when she was going to be back, but that she would try to be back as soon as she could. She said that she would be thinking about him always and that she loved him. "That’s all I could do," she said. Talbot now sits behind bars. She calls her parents and friends everyday. She talks to Phillip, still assuring him she will be home – she's just not sure when. Talbot says she wants everyone to know what she did was in self defense, and from a mother's instinct to protect. "In this case, there could have been two people dead instead of one," Talbot said. "It could have been Phillip and I. I didn’t do it with maliciousness or anything like that. I really knew if it wasn’t him it was going to be us, and I was in fear for Phillip and myself and I had to make a choice. I hope people understand that." A women's group made up of Talbot's friends and family are now in the process of writing letters to Gov. Gretchen Whitmer to explain her case. The years of abuse she dealt with, and the constant threats. The group will ask the governor to pardon Talbot. When asked asked if she deserved to be pardoned, Talbot responded, "This would be the perfect case to do it." If you or someone you know is a victim of domestic violence, there is help. Contact the National Domestic Violence hot line at 1−800−799−7233, TTY 1−800−787−3224 or click here .